Every once in a while, you get a craving for a little something tasty. You don’t want that entire box of chocolates but you don’t have the will power to open the box and just take one. After all, once the box is open, who will notice just another one? Next thing you know, you didn’t stop until the entire box of chocolates is gone. No, I don’t speak from personal experience. This is just what I’ve heard from others. Why do you ask? Sometimes it’s like that with spinning as well. You just want a small little something to carry along with you. But spinning a 4-8 oz braid of fiber is anything but instant gratification. 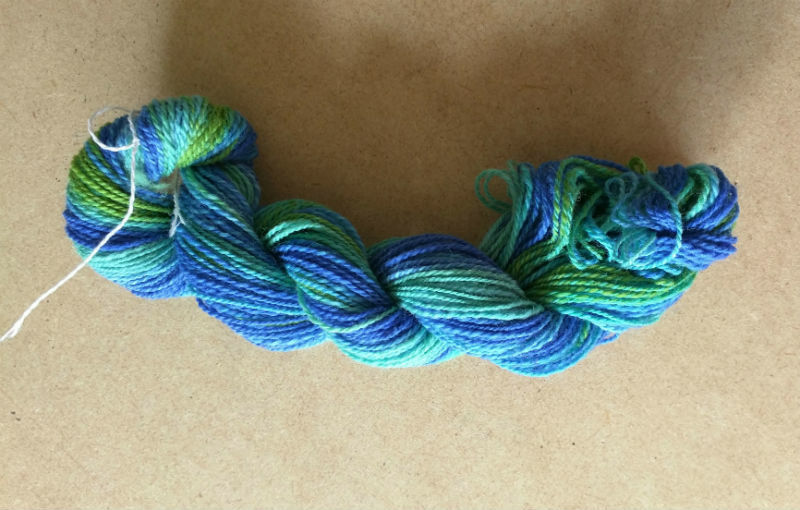 Enter Greenwood Fiberworks‘ Pigtails — approximately half ounce (label says 0.4-0.6 oz) of wool, beautifully dyed. Just enough to take to a meeting and spin and ply the entire amount on a single spindle. I don’t think these are part of her regular stock. I picked these up at CNCH a few years ago. CNCH 2014, perhaps? She had a small rack of these tasty little morsels. It was just too tempting. For the first one, I split it in half and spun each half separately. I wound them off onto individual weaving bobbins before winding them together onto a 3rd bobbin for plying. 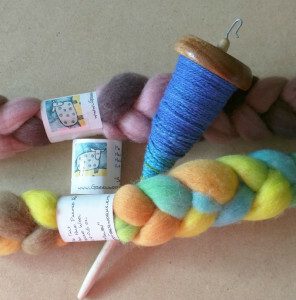 I think because of how fresh the singles were, I had a difficult time plying them from their own bobbins directly. Too many pigtails. I think for the next one, I will spin it as a continuous strand and wind it into a center pull ball before plying. I will still split it in half, but reverse the direction on the second half so the colors will still mostly line up. I pulled out my Bosworth Mini for this little project. It’s strange. I’ve always remembered these as fast little spindles with long spin, but that wasn’t my experience this time around. 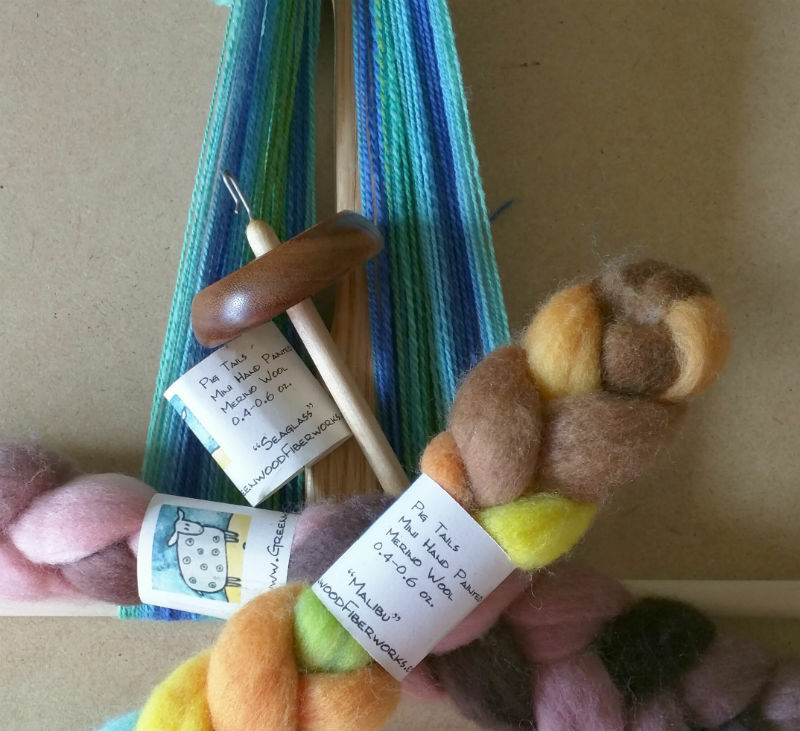 Perhaps it’s because I’ve been mostly spinning silk on my Goldings. There is nothing like those little Goldings for speed! 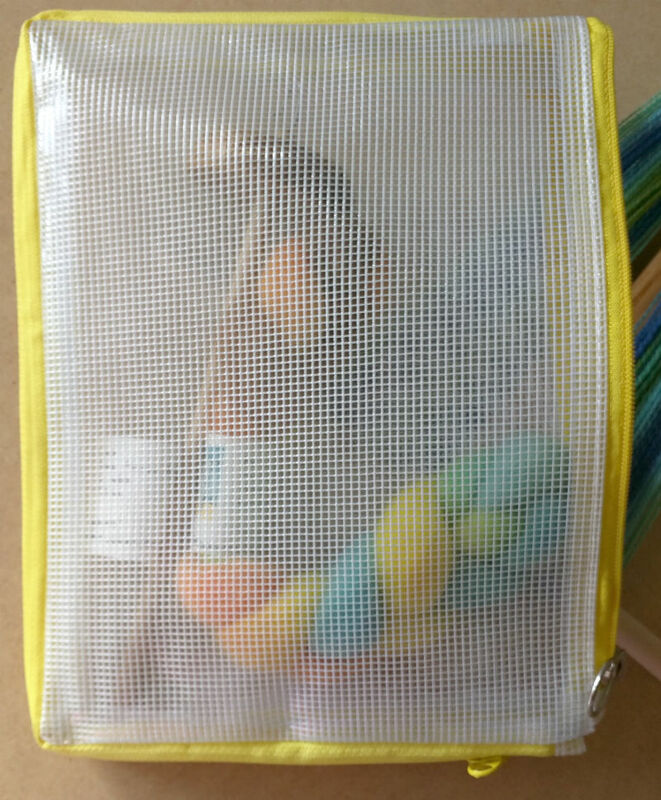 Speaking of on the go spinning, I’ve upgraded my little quart sized zip lock bag to this pouch. It’s a plastic (no more spilled water, tea, wine!) 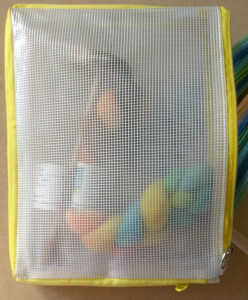 expandable zippered pouch that I picked up at Daiso. I use a similar one to carry my travel watercolor kit.